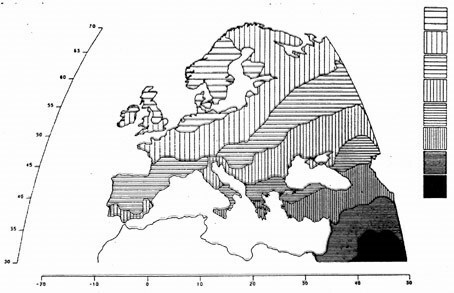 The map illustrates the first principal component (PC) of molecular genetic variation in Europe, suggesting demic diffusion from Antolia, probably associated with the spread of farming. The range between the maximum and the minimum values of the PC has been divided into eight equal classes, which are indicated by different intensities of shading. The direction of increase of PC values is arbitrary. From Cavalli-Sforza et al. 1994: 192, reproduced by permission of the authors and Princetown University Press.